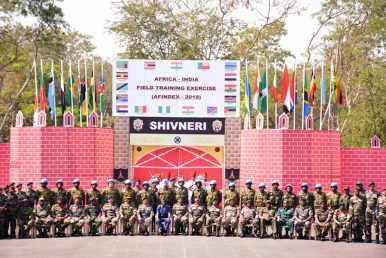 AFINDEX-19 underscores India’s growing military-to-military ties with a range of African states. The exercise will focus on exchange of best practices between the participating nations, team building and tactical level operations in conduct of United Nations mandated tasks to include establishment of a new mission, siting of a United Nations Headquarters for Peace Keeping operations, siting of Military Observer sites during the peace keeping missions, protection of civilians, nuances of standing combat deployment, convoy protection, patrolling aspects and aspects related to Humanitarian Mine Assistance. As of February 2019, India was the fourth largest contributor to United Nations peacekeeping operations around the world, contributing some 6,453 personnel. Many of the African states participating in AFINDEX-19 are also major contributors, including Egypt, Niger, Ghana, and Uganda. The inaugural AFINDEX marks the continued growth of India’s outreach to Africa, which has intensified under the government of Prime Minister Narendra Modi since 2014. In 2015, India convened the third India-Africa Forum Summit in New Delhi, which brought together several African heads of state and government in India. In December 2018, Indian Chief of Army Staff General Bipin Rawat toured Kenya and Tanzania to lay the groundwork for growing military-to-military cooperation between India and two major African states. Both Nairobi and Dodoma sent contingents to the inaugural AFINDEX exercise. South Africa and India have held notably high-level and frequent defense exchanges for years. Alongside Brazil — a fellow member of the BRICS grouping of five emerging powers, along with Russia and China—South Africa and India hold the India-Brazil-South Africa Maritime (IBSAMAR) naval exercises. The most recent iteration of that exercise took place in October 2018. India has a range of political, economic, strategic, and cultural interests across the African continent. Its growing interest in recent years has accompanied efforts by China to develop its own relationships in the region.